The scene above has been repeated a number of times, according to my fans. Really. It usually goes down like this: a human brings up one of my YouTube videos on their computer, and another cat (obviously one with great musical taste and an appreciation of real feline talent) enters the room, jumps up on the desk or bed, etc. and proceeds to interact with the image of yours truly on the screen. 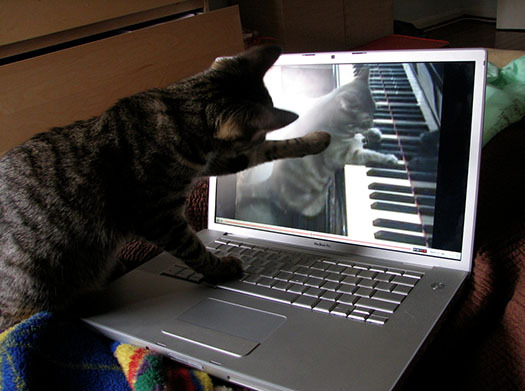 This interaction can take several forms: 1) Pawing at the screen. 2) Meowing. 3) Sitting quietly and staring with rapt attention at the amazing performance unfolding in front of them. The cat pictured above is named Muffin, and her human, Nathalie Cone, took this photo of Muffin expressing her admiration for the diva. That’s me. Anyway, I want to thank Nathalie and Muffin for permission to post this wonderful photo. And I’d also like to invite all of my human fans to send me photos or videos of their feline companions showing them appreciating my videos. Please include your names, as well. By sending me the photos or short video clips (links to clip on YouTube preferred, if available), you are agreeing to allow me to post the images or links on my blog/website. Wow, my cats have never done that! I should see if my new cat, Mojo would do that, that would be cool. BTW, the day before I got my cat, Mojo I wore my Nora shirt and put in the cat carrier for him to get used to my scent. I don’t think he wants to give it back to me! Nora, you haven’t tweeted in a long time, what’s up?